Wikipedia is written collaboratively by largely anonymous Internet volunteers who write without pay. Anyone with Internet access can write and make changes to Wikipedia articles (except in certain cases where editing is restricted to prevent disruption or vandalism). Users can contribute anonymously, under a pseudonym, or with their real identity, if they choose. People of all ages, cultures and backgrounds can add or edit article prose, references, images and other media here. What is contributed is more important than the expertise or qualifications of the contributor. What will remain depends upon whether it fits within Wikipedia's policies, including being verifiable against a published reliable source, so excluding editors' opinions and beliefs and unreviewed research, and is free of copyright restrictions and contentious material about living people. Contributions cannot damage Wikipedia because the software allows easy reversal of mistakes and many experienced editors are watching to help and ensure that edits are cumulative improvements. Begin by simply clicking the edit link at the top of any editable page! Wikipedia is a live collaboration differing from paper-based reference sources in important ways. Unlike printed encyclopedias, Wikipedia is continually created and updated, with articles on historic events appearing within minutes, rather than months or years. Older articles tend to grow more comprehensive and balanced; newer articles may contain misinformation, unencyclopedic content, or vandalism. Awareness of this aids obtaining valid information and avoiding recently added misinformation (see Researching with Wikipedia). What Wikipedia is not circumscribes Wikipedia's scope. Further information on key topics appears below. Further advice is at Frequently asked questions, advice for parents, or see Where to ask questions. For help getting started with editing or other issues, see Help:Contents. For more details on this topic, see History of Wikipedia. Wikipedia was founded as an offshoot of Nupedia, a now-abandoned project to produce a free encyclopedia. Nupedia had an elaborate system of peer review and required highly qualified contributors, but the writing of articles was slow. During 2000, Jimmy Wales, founder of Nupedia, and Larry Sanger, whom Wales had employed to work on the project, discussed ways of supplementing Nupedia with a more open, complementary project. Multiple sources suggested the idea that a wiki might allow members of the public to contribute material, and Nupedia's first wiki went online on January 10, 2001. There was considerable resistance on the part of Nupedia's editors and reviewers to the idea of associating Nupedia with a website in the wiki format, so the new project was given the name "Wikipedia" and launched on its own domain, wikipedia.com, on January 15 (now called "Wikipedia Day" by some users). The bandwidth and server (in San Diego) were donated by Wales. Other current and past Bomis employees who have worked on the project include Tim Shell, one of the cofounders of Bomis and its current CEO, and programmer Jason Richey. The domain was eventually changed to the present wikipedia.org when the not-for-profit Wikimedia Foundation was launched as its new parent organization, prompting the use of a ".org" domain to denote its non-commercial nature. In May 2001, a wave of non-English Wikipedias was launched—in Catalan, Chinese, Dutch, Esperanto, French, German, Hebrew, Italian, Japanese, Portuguese, Russian, Spanish, and Swedish. These were soon joined by Arabic and Hungarian. In September, Polish was added, and further commitment to the multilingual provision of Wikipedia was made. At the end of the year, Afrikaans, Norwegian, and Serbo-Croatian versions were announced. Wikipedia is a registered trademark of the not-for-profit Wikimedia Foundation, which has created a family of free-content projects that are built by user contributions. Most of Wikipedia's text and many of its images are dual-licensed under the Creative Commons Attribution-Sharealike 3.0 Unported License (CC-BY-SA) and the GNU Free Documentation License (GFDL) (unversioned, with no invariant sections, front-cover texts, or back-cover texts). Some text has been imported only under CC-BY-SA and CC-BY-SA-compatible license and cannot be reused under GFDL; such text will be identified either on the page footer, in the page history or on the discussion page of the article that utilizes the text. Every image has a description page which indicates the license under which it is released or, if it is non-free, the rationale under which it is used. Anyone with Web access can edit Wikipedia, and this openness encourages inclusion of a tremendous amount of content. About 91,000 editors—from expert scholars to casual readers—regularly edit Wikipedia, and these experienced editors often help to create a consistent style throughout the encyclopedia, following our Manual of Style. Several mechanisms are in place to help Wikipedia members carry out the important work of crafting a high-quality resource while maintaining civility. Editors are able to watch pages and techies can write editing programs to keep track of or rectify bad edits. Where there are disagreements on how to present facts, editors work together to arrive at an article that fairly represents current expert opinion on the subject. Text on Wikipedia is a collaborative work, and the efforts of individual contributors to a page are recorded in that page's history, which is publicly viewable. See Help:Page history. Information on the authorship of images and other media, such as sound files, can be found by clicking on the image itself or the nearby information icon. The file page for the image or media will be displayed and it includes the author and source, where appropriate, along with other information. See Help:File page. Many visitors come to Wikipedia to acquire knowledge, others to share knowledge. At this very instant, dozens of articles are being improved, and new articles are also being created. Changes can be viewed at the Recent changes page and a random page at random articles. Over 2,000 articles have been designated by the Wikipedia community as featured articles, exemplifying the best articles in the encyclopedia. Another 7,000 articles are designated as good articles. Some information on Wikipedia is organized into lists; the best of these are designated as featured lists. Wikipedia also has portals, which organize content around topic areas; our best portals are selected as featured portals. Articles can be found using the search box on the top-right side of the screen. Wikipedia is available in languages other than English. Wikipedia has more than two hundred languages (see other language versions), including a Simple English version, and related projects include a dictionary, quotations, books, manuals, and scientific reference sources, and a news service (see sister projects). All of these are maintained, updated, and managed by separate communities, and often include information and articles that can be hard to find through other common sources. Wikipedia articles are all linked, or cross-referenced. When highlighted text like this is seen, it means there is a link to some relevant article or Wikipedia page with further in-depth information elsewhere. Holding the mouse over the link will often show to where the link will lead. The reader is always one click away from more information on any point that has a link attached. There are other links towards the ends of most articles, for other articles of interest, relevant external websites and pages, reference material, and organized categories of knowledge which can be searched and traversed in a loose hierarchy for more information. Some articles may also have links to dictionary definitions, audio-book readings, quotations, the same article in other languages, and further information available on our sister projects. Further links can be added if a relevant link is missing, and this is one way to contribute. Users should be aware that not all articles are of encyclopedic quality from the start: they may contain false or debatable information. Indeed, many articles start their lives as displaying a single viewpoint; and, after a long process of discussion, debate, and argument, they gradually take on a neutral point of view reached through consensus. Others may, for a while, become caught up in a heavily unbalanced viewpoint which can take some time—months perhaps—to achieve better balanced coverage of their subject. In part, this is because editors often contribute content in which they have a particular interest and do not attempt to make each article that they edit comprehensive. However, eventually, additional editors expand and contribute to articles and strive to achieve balance and comprehensive coverage. In addition, Wikipedia operates a number of internal resolution processes that can assist when editors disagree on content and approach. Usually, editors eventually reach a consensus on ways to improve the article. The ideal Wikipedia article is well-written, balanced, neutral, and encyclopedic, containing comprehensive, notable, verifiable knowledge. An increasing number of articles reach this standard over time, and many already have. Our best articles are called Featured Articles (and display a small star in the upper right corner of the article), and our second best tier of articles are designated Good Articles. However, this is a process and can take months or years to be achieved, as each user adds their contribution in turn. Some articles contain statements which have not yet been fully cited. Others will later be augmented with new sections. Some information will be considered by later contributors to be insufficiently founded and, therefore, may be removed or expunged. Wikipedia has advantages over traditional paper encyclopedias. Wikipedia has a very low "publishing" cost for adding or expanding entries and a low environmental impact in some respects, since it never needs to be printed, although computers have their own environmental cost. In addition, Wikipedia has wikilinks instead of in-line explanations and it incorporates overview summaries (article introductions) with the extensive detail of full articles. Additionally, the editorial cycle is short. A paper encyclopedia stays the same until the next edition, whereas editors can update Wikipedia at any instant, around the clock, to help ensure that articles stay abreast of the most recent events and scholarship. Wikipedia is open to a large contributor base, drawing a large number of editors from diverse backgrounds. This allows Wikipedia to significantly reduce regional and cultural bias found in many other publications, and makes it very difficult for any group to censor and impose bias. A large, diverse editor base also provides access and breadth on subject matter that is otherwise inaccessible or little documented. A large number of editors contributing at any moment also means that Wikipedia can produce encyclopedic articles and resources covering newsworthy events within hours or days of their occurrence. It also means that like any publication, Wikipedia may reflect the cultural, age, socio-economic, and other biases of its contributors. There is no systematic process to make sure that "obviously important" topics are written about, so Wikipedia may contain unexpected oversights and omissions. While most articles may be altered by anyone, in practice editing will be performed by a certain demographic (younger rather than older, male rather than female, rich enough to afford a computer rather than poor, et cetera) and may, therefore, show some bias. Some topics may not be covered well, while others may be covered in great depth. Allowing anyone to edit Wikipedia means that it is more easily vandalized or susceptible to unchecked information, which requires removal. See Wikipedia:Administrator intervention against vandalism. While blatant vandalism is usually easily spotted and rapidly corrected, Wikipedia is more subject to subtle viewpoint promotion than a typical reference work. However, bias that would be unchallenged in a traditional reference work is likely to be ultimately challenged or considered on Wikipedia. While Wikipedia articles generally attain a good standard after editing, it is important to note that fledgling articles and those monitored less well may be susceptible to vandalism and insertion of false information. Wikipedia's radical openness also means that any given article may be, at any given moment, in a bad state, such as in the middle of a large edit, or a controversial rewrite. Many contributors do not yet comply fully with key policies, or may add information without citable sources. Wikipedia's open approach tremendously increases the chances that any particular factual error or misleading statement will be relatively promptly corrected. Numerous editors at any given time are monitoring recent changes and edits to articles on their watchlist. Wikipedia is written largely by amateurs. Those with expert credentials are given no additional weight. Some experts contend that expert credentials are given less weight than contributions by amateurs. Wikipedia is also not subject to any peer review for scientific or medical or engineering articles. One advantage to having amateurs write in Wikipedia is that they have more free time on their hands so that they can make rapid changes in response to current events. The wider the general public interest in a topic, the more likely it is to attract contributions from non-specialists. The MediaWiki software that runs Wikipedia retains a history of all edits and changes, thus information added to Wikipedia never "vanishes". Discussion pages are an important resource on contentious topics. Therefore, serious researchers can often find a wide range of vigorously or thoughtfully advocated viewpoints not present in the consensus article. As with any source, information should be checked. A 2005 editorial by a BBC technology writer comments that these debates are probably symptomatic of cultural changes that are happening across all sources of information (including search engines and the media), and may lead to "a better sense of how to evaluate information sources." Wikipedia disclaimers apply to all pages on Wikipedia. However, the consensus in Wikipedia is to put all disclaimers only as links and at the bottom of each article. Proposals to have a warning box at the top have been rejected. Some do not like the way it looks or that it calls attention to possible errors in Wikipedia. 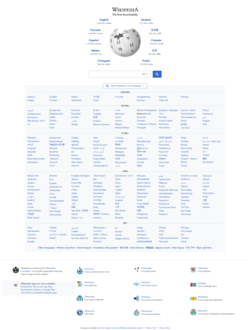 Wikipedia, in common with many websites, has a disclaimer that, at times, has led to commentators citing these in order to support a view that Wikipedia is unreliable. A selection of similar disclaimers from places which are often regarded as reliable (including sources such as Encyclopædia Britannica, Associated Press, and the Oxford English Dictionary) can be read and compared at Non-Wikipedia disclaimers. Wikipedia content advisories can also be found here. Discussion. Shows a user discussion about the article's topic and possible revisions, controversies, etc. Edit. This tab allows users to edit the article. Depending on the page’s susceptibility to vandalism, according to its visibility or the degree of controversy surrounding the topic, this tab may not be shown for all users. (For example, any user who is not an administrator will not be able to edit the Main Page). The Wikipedia community is largely self-organising, so that anyone may build a reputation as a competent editor and become involved in any role he/she may choose, subject to peer approval. Individuals often will choose to become involved in specialised tasks, such as reviewing articles at others' request, watching current edits for vandalism, watching newly created articles for quality control purposes, or similar roles. Editors who believe they can serve the community better by taking on additional administrative responsibility may ask their peers for agreement to undertake such responsibilities. This structure enforces meritocracy and communal standards of editorship and conduct. At present a minimum approval of 75–80% from the community is required to take on these additional tools and responsibilities. This standard tends to ensure a high level of experience, trust, and familiarity across a broad front of aspects within Wikipedia. Bureaucrats are chosen in a process similar to that for selecting administrators. There are not very many bureaucrats. They have the technical ability to add or remove admin rights, approve or revoke "bot" privileges, and rename user accounts. The Arbitration Committee is kind of like Wikipedia's supreme court. They deal with disputes that remain unresolved after other attempts at dispute resolution have failed. Members of this Committee are elected by the community and tend to be selected from among the pool of experienced admins. Stewards are the top echelon of technical permissions, other than the Wikimedia Board of Directors. Stewards can do a few technical things, and one almost never hears much about them since they normally only act when a local admin or bureaucrat is not available, and hence almost never on the English Wikipedia. There are very few stewards. Jimmy Wales, the founder of Wikipedia, has several special roles and privileges. In most instances however, he does not expect to be treated differently than any other editor or administrator. Wikipedia uses MediaWiki software, the open-source program used not only on Wikimedia projects but also on many other third-party websites. The hardware supporting the Wikimedia projects is based on several hundred servers in various hosting centers around the world. Full descriptions of these servers and their roles are available on this meta page. For technical information about Wikipedia, check Technical FAQs. Wikipedia publishes various types of metadata; and, across its pages, are many thousands of microformats. Wikipedia does not place cookies or other tracking software on users' computers except for cookies associated with logging into a Wikimedia account, including for the English Wikipedia. Wikipedia:Help desk—Wikipedia's general help desk, if other pages have not answered the query. For specific discussion not related to article content or editor conduct, see the Village pump, which covers such subjects as announcements, policy and technical discussion, and information on other specialized portals such as the help, reference and peer review desks. The Community Portal is a centralized place to find things to do, collaborations, and general editing help information, and find out what is happening. For more information, the first place to go is the Help:Contents. To contact individual contributors, leave a message on their talk page. Standard places to ask policy and project-related questions are the Village Pump, online, and the Wikipedia mailing lists, over e-mail. Reach other Wikipedians via IRC and e-mail. In addition, the Wikimedia Foundation meta-wiki, a site for coordinating the various Wikipedia projects and sister projects (and abstract discussions of policy and direction). Also available are places for submitting bug reports and feature requests. For a full list of contact options, see Wikipedia:Contact us. Please note that while other sites may also use MediaWiki software and therefore look similar to Wikipedia, or may have a name that includes 'Wiki-' or '-pedia', or a similar domain name, the only projects which are part of the Wikimedia Foundation are those listed above and Wikipedia, even if other projects claim to be part of it. ↑ In some parts of the world, the access to Wikipedia had been blocked. ↑ "Report card". Wikimedia. Retrieved May 18, 2011 . ↑ Angwin, Julia, The Web's New Gold Mine: Your Secrets: What They Know (a Wall St. J. Investigation) (1st in ser. ), in The Wall Street Journal., § Weekend Journal, Jul. 31–Aug. 1, 2010 (4-star ed. ), p. W1, col. 2 (test of popular websites including Wikipedia found no tracking software was installed by Wikipedia). ↑ E.g., the en-WP user login page, as accessed Jan. 22, 2011.